I thought it would be worth commenting on Professional Development (Template 4). Along with the Summary of Experience, this template often gets neglected or left sparsely populated. Unfortunatley, quite a large number of candidates pay little attention to the professional development skill split requirement which is a real shame as the APC assessors are expecting APC candidates to follow the guidance to the letter. By not following the guidance you simply let yourself down and if you have a bit of a bad day at the final assessment the errors made with the skills splits just serve to escalate the chance of being referred. In the APC Candidate’s Guide (pages 15 and 16) it clearly discusses the requirements and the need to break down the 48 hours per year into three key skill areas. Personal Skills: This is predominantly focused on the Mandatory Competencies. You should consider what type of learning this would include with an eye on how the choices you make link back to your declared competencies. I would normally expect ‘personal skills’ to fit a high proportion of softer skills, such as, presentation skills, client care,communication and report writing etc., but don’t loose sight of the other Mandatory areas such as Health and Safety, Conflict Avoidance… and Sustainability. They are all very important subject areas. Useful documents such as the RICS Guide to Surveying Safely or the RICS Practice Management Guidelines or the current consultation on CDM are ideal learning. Also involvement in RICS matrics events etc would all fit neatly under this skill split. Professional Practice Skills: Interestingly this is often the most misunderstood skill split and often candidates just record a few hours here and there or allocate learning that would be better placed in one of the other skill split areas. This skill area clearly includes Rules of Conduct and Ethics. It clearly points out in the guide that client care or conflict avoidance or knowledge of your Institution’s structure and goals is also relevant. I am not entirely sure why this skill split is often so badly recorded as the Rules of Conduct and Ethics are such a large area of knowledge. Have you considered the Bye-Laws and Regulations, Members and Firms Rules with all of the associated back up Help sheets and Policy documents. Remember Professional Development is all about ‘currency’ of learning. By this I mean you are not relating all of your learning to historical or out of date information but you are keeping up to date with the latest journals, the latest thinking and industry buzz. 1. Caution: REMEMBER what you write is ‘fair game’ for the Assessors to question. So make sure you can back it ALL up in the interview! 2. Tip: Use your word count to best effect. Often candidates only write a small amount when they could have developed the detail in their descriptions to a much more conclusive response. 3. 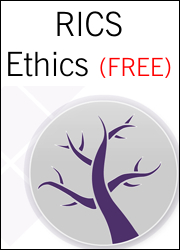 Intelligence: Did you know the RICS recently updated the Requirements and Competencies and Pathway guides between January 2014 and April 2014. Hot News “**NEW** PER online ! Places are limited and we do expect a huge demand, so don’t be disappointed book now ! Are you looking to do your APC through the PER – Professional Experience Route? For those of you undertaking the APC PER Final Assessment this Autumn you will be in the throws of completing the Preliminary Assessment Documentation if not already submitting it for review. Don’t forget the cut off dates for the next stage, application for your final assessment, will be upon us in July and August and then final documentation submission in August and September. You can find all of the dates on the RICS web site. 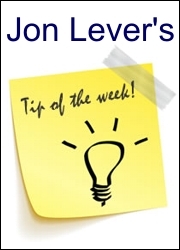 It is important to remind anyone doing or seeking to do the APC PER it is not an easier route to Final Assessment, if anything, in my view, it actually is a little bit harder due to the restriction on word count etc., if you don’t approach the task properly. 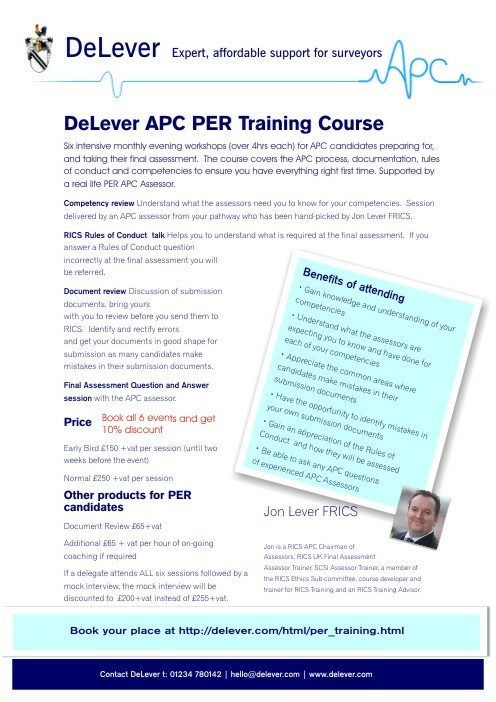 All you have to do is consider the support you need and then come along and take a look at the DeLever APC PER Training course I have devised for you. The course provides you with six bite size events, starting on the 31st July 2014 with three events that get you ready for the preliminary assessment in October / November 2014 and thereafter another three events taking you through to submission and the final assessment preparation in Spring 2015. The course is run my Jon Lever FRICS and a number of DeLever APC Coaches who will be from your Pathway and assess PER. Come back to me if you have any queries and I look forward to seeing you there and letting me help you to achieve your Chartered Surveyor goal.